Morning after, Day ahead...: It's a new start! It's officially 2012... Happy New Year! I'm both thankful and excited for the new year and optimistically looking forward to the challenges and experiences 2012 will bring. Starting my 2nd blog is my first new venture for 2012. My first blog, MD Bound started in November 2010, was primarily about medicine and my journey through medical school. Although I had interesting experiences to share, I felt the blog was lacking. I was confined to one topic, yet had so many things to share regarding other interests of mine. I ended MD Bound in April 2011 and decided to revisit blogging at a later time, hoping to find inspiration for a new direction. Well, it came... 8 months later. With this blog Morning after, Day ahead, I hope to not only share my experiences in medical school but also focus on a broader topic of health & wellness. I am an advocate for holistic health. As I mature, I find myself consciously seeking spiritual, physical, and mental balance. Some say it's when that balance is obtained, that one is living life to its fullest potential. Yet, it's also life's challenges that can easily offset the very balance you worked so hard to achieve. So, in my opinion as long as you're striving for a life filled with wholeness; a balance that fits you no matter how uneven it might seem to another, you're living life to the fullest. I want to share my journey in seeking my life balance, and in doing so provide helpful tips, information, and personal stories. General posts will be on the home page, as well as updates for new posts under the different tabs. The photo above is the Chicago skyline. 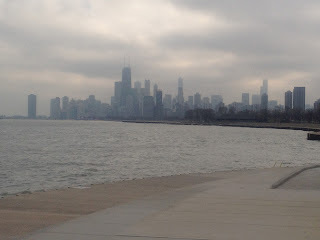 I spent Christmas and New Year in Chicago. I officially declare it my favorite city. Below is a short video I made on December 31, 2011. I took a walk along Lake Michigan to reflect on the year. Very peaceful.